Change is the only constant on the streets. Just as the good folks of inner-city Baltimore got used to Avon Barksdale calling the shots, he was sent to jail and a soulless monster named Marlo Stanfield was suddenly the most powerful drug dealer on HBO’s hit series, The Wire. A cold-blooded killer like Stanfield has no shortage of enemies. 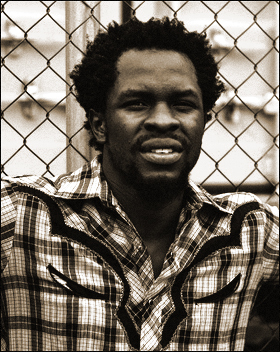 That’s why a right-hand man like Chris Partlow is vital to protect Marlo against rivals. Partlow is a loyal assassin who does whatever it takes to guard Stanfield without ever asking why. 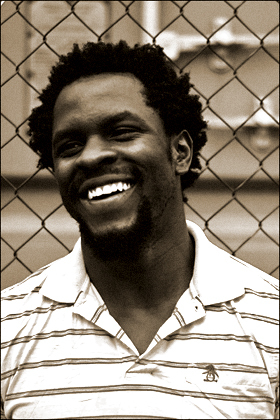 We recently had a chance to sit down with Gbenga Akinnagbe, the talented actor who plays Partlow, to talk about life on The Wire, working with Philip Seymour Hoffman and his amateur wrestling background. You are originally from the Washington, DC area. Where do you call home now? New York, I’ve been here for it feels like a long time. I’m not sure exactly how many years I’ve been here. All the years blend together. I’ve been here for I think four or five years and I spend most of my time here. But I still love the DC area. Whenever I go back, I’m very appreciative of the area. But I think New York is my spot. Did you grow up in DC? I grew up in Montgomery County. I was born in DC. And my whole family’s from Nigeria. How did you get into acting? How old were you when you started and how did you decide this is what you wanted to do for a living? I started when I was 21. I used to work for the federal government and I didn’t know anything about acting, I wasn’t even all that interested in it. Then, I don’t know, I just got curious about it and I researched it, I bought some books. I went online to see what actors do. And then I started going on auditions. Even when I started going on the auditions, I wasn’t really trying to pursue it. I got cast at the Shakespeare Theatre in DC and I had to decide whether I was going to leave my good government job or stay. And I decided to leave and I’ve been acting since. Once you made the decision, was it pretty easy to get cast or did you have a tough time getting roles? The truth of the matter is I was really ignorant. I didn’t know it was supposed to be hard, so I just continued to get work. I didn’t know that you needed an agent or a manager, so I got work by myself. I would go to auditions. I would get people to help me, my friends, and while I was working in these plays, these professional actors would help me with other auditions. Money was tight, but I always ate. I’m not going to say it was easy, but I worked consistently. Your first credited film role was in They’re Made Out of Meat, a short film starring Tom Noonan. The name was too great not to bring it up. What can you tell us about the film? It was a student film that got some money and some backing and became a small indie – a 10-minute film. Yeah, that’s the first thing I did. I found that, I think, in Backstage. It’s when I was going out there and I still didn’t have representation, so I would find work wherever I could find it. I went in, I think it was the New York Film Academy, and auditioned for this Irish director, Stephen was his name, and he did the film. And in the end product, they cut out most of my stuff. It’s based off of a short science fiction story. They wrote this 10-minute film about it. These two detectives – they appear to be detectives, but you’re never quite sure – they meet in a diner and start talking about what they’re discovering. You realize they’re talking about people, human beings, and how they are appalled and amazed to find out that human beings are made out of meat – that they talk with the meat, flapping meat, and that they perspire and so on. You see everyone in the diner and so on. And that’s pretty much it. (Laughs.) It’s a 10-minute film. 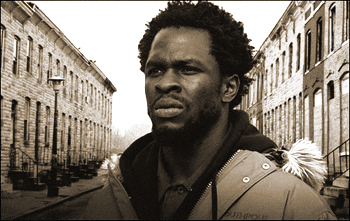 Of course, you play Chris Partlow on the best show on television today, The Wire. How did you end up getting cast on the show and how was the character described to you initially? I moved from Maryland at the time. I was in Jersey. 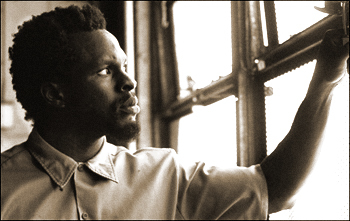 And I would get calls from casting directors in the DC/Maryland area sometimes and they brought me down to audition for the Marlo Stanfield role. I auditioned for different roles a couple times. I was an extra on the show, I was actually even a background extra in the pilot episode. It was a long time ago. Then, after I auditioned for Marlo, they offered me Slim Charles, which I ended up taking. But then when it got closer to the film date, filming that episode conflicted with something else I was doing and I was trying to decide what I should do. And I ended up turning that role down and later on, I was kicking myself, wondering if I should have turned that down. Then the summer came and they called me up and said, “The writers and producers really like you and they have a larger role. They want to know if you’ll take it.” I said yes, and it was Chris. That definitely worked out that you passed on Slim Charles then. Oh absolutely. Everything happens for a reason and I was very fortunate. What did they tell you about Chris originally? It’s an interesting character, he doesn’t give much of himself away, but the show continues to give small glimpses into another side of him besides his role as Marlo’s muscle. His frustration over being separated from his family while being on the lamb, his understanding of Michael’s problem with the abusive stepfather in season four and the strain on his relationship with Marlo this season all seem to hint that there is more to Chris than meets the eye. Was the character ever laid out for you or do you just get these little pieces from the script? It’s a combination of both. The writing is really good, so as an actor you try to extract as much as you can from the writing. And you get hired because of your interpretation and what they think you can do with it, so they have that trust in your collaboration with it. So I’d get the script and I remember them telling me very little about the script. I remember asking them, “Give me more, give me more” because I wanted to just soak it all up and work with it and so on. And he told me, “You were hired because of what you can do with it and now you take it and do what you can do with it.” So from the writing of the scripts and what they put into it, what came out was my interpretation. So how do you see the character? What is your interpretation? I think Chris is – we all have our dark side, but Chris is a dark side exaggerated and manifested. Basically, he’s a sociopath, but I don’t want to just categorize him as that, although it’s hard not to categorize someone with the label sociopath. He’s very indifferent. He could just as easily take your hand as kill you. Whereas Snoop is a psychopath, she’s got a thrill for this, she really enjoys it and so on, Chris cares for very few things in life and very few people. Among them are Marlo and Snoop, his family and so on. He’s got extreme tunnel vision. If there’s something on his plate, that’s what happens. That’s what’s being taken care of. Which makes him very good at what he does, but it doesn’t leave room for anything else in life, which he’s fine with. Do you get along well offscreen with Felicia Pearson and Jamie Hector? I hate them. (Laughs.) No, no, we get along great. I hang out with them. I’m doing a play in New York, Jamie, who plays Marlo, is coming out to check out the play. We’re very supportive of one another and we have a lot of fun together. It’s a good cast, on and off screen. We hang out when we can. It’s a very large cast, so we don’t get that much of an opportunity. But those of us who live in New York, we make efforts to support each other’s work and hang out, which is great. What was it like on set with so many characters being killed of this season? Were actors paranoid about having their characters killed off? Ha! Every season of The Wire there’s a paranoia because after Stringer Bell died, pretty much anyone can go. Stringer was a very popular character, Idris is a great actor, and if he could get killed off, then anybody could, which is great because it keeps a liveliness to the show. It keeps you very aware and in the present time both on and off set. And also, there’s a reality to that. If you’re on the streets, it’s not like just because you’re popular, that doesn’t mean you are going to last. Only in television-land does that happen. And if you’re doing dirt on many different sides, you’re shortening your lifespan on the street anyway. So yeah, we all felt that a stray bullet can come down any one of those alleys and take any one of us out. Are you happy to have made it this far? Obviously, you are in jail, but it could be worse, right? Yeah, it could be worse. But The Wire‘s the type of show that if you have a great death, a glorious death, that can be even better than living sometimes. Speaking of character’s deaths, it certainly seemed like Chris was disappointed that he wasn’t the one who took out Omar. Were you disappointed that your character didn’t get to have that final confrontation? Part of me was, honestly, because I was looking for it for like over two years. From the moment that Chris was put on the show, I was told there was a good chance this was where it’s heading – Chris and Omar, Chris and Omar. I went, “Okay, this could be good.” But, as far as the writing aspect of it, I thought it was fascinating that they had Kenard do it. I thought that was very interesting. So the selfish part of me wanted to be the one to blow Omar away, but the writer in me was fascinated by what they did do. We thought you had him when he was pinned down in the apartment. Ah! We should have had him. Don’t even tell me. We know you won’t tell us anything, but we have to ask – what can we expect from the last episode? Chris actually runs for mayor, he gets his law degree in prison. No, I’m just kidding. The last episode, you can expect a longer episode. With the montage and everything, we’re granted a little more time. They’re trying to fit 13 episodes worth of material in 10 and they’ve done the best job you can with that. So it’s going to be pretty interesting. I won’t give you any details. Being a part of The Wire for so long, what was it like to see it come to an end? It was weird. It ended like any other season doing that show. It didn’t really hit me that we weren’t coming back. It still hasn’t hit me that we aren’t coming back. But also, I was very grateful to have been a part of that show, even considering that we’re not coming back. It’s a rare occurrence to have that show on television and to have been a part of it for my first television job was a blessing. I didn’t have any regrets and I wasn’t sad at all. I was grateful. Since it has been overlooked by the Emmys and never really received the credit it deserved, how do you think the show will be remembered? I think it will be remembered as one of the best television shows that ever was. It’s funny because with it being neglected or ignored by the awards organizations, they kind of sealed it in history. They helped that. I know that us not getting awards and nominations helped bond us as a cast because with all that out the door, all we were left with was to be really appreciative of the work. I think, with the years, people will start to see it and pick it up and realize, if they didn’t catch it, what they missed and hopefully they’ll get into it. It’s not an easy show to get into, to be honest. It requires a great deal from the viewers. It’s not like one of those shows you can pick up and watch and then forget about. It does haunt people. I’ve been told by many people that they couldn’t sleep after watching it, not necessarily because of the violence, but because of the ramifications of how deep what they saw affects them because of how real it is in real life. As an actor, what is it like to film those violent scenes? Does it weigh on you emotionally to film such dark moments? To be honest, yeah there’s residue, especially when I first started doing the show. There be a lot of negativity leftover after filming, but as I grew as an actor, I became better at coming in and out of that; being there one moment honestly and then leaving that time, especially considering the material, especially considering my role on that show. You can’t carry it with you or else you’ll go crazy. What does the future hold for you now that The Wire is wrapped? What’s on the horizon for you? I’m currently doing a play at the Flea Theater in Lower Manhattan called Lower Ninth. It’s about Katrina 24 hours after it hit. I have a movie out in theaters right now called The Savages with Laura Linney and Philip Seymour Hoffman and Philip Bosco. It was just nominated for two Oscars last week. And I’m about to start production on a film called The Taking of Pelham 123 with Tony Scott, Denzel and John Travolta. In The Savages, Laura Linney and Philip Seymour Hoffman play a sister and brother, correct? Yeah, they’re a brother and sister in a dysfunctional family and they haven’t seen their father in years. He’s actually the one that made them dysfunctional. They’re called to get him after he starts becoming demented and losing his mind. They put him in a home. I play an aid in the home that looks out for the father. All Laura’s relationships with men in the movie are kind of off and twisted until she comes and she’s visiting her father and she kind of opens up to me. Towards the end she kind of misconstrues the little camaraderie that we’re having and, you have to see it. It gets kind of funny and sad. It was fascinating to see Philip work and Laura and to be in scenes with them. Shortly after the movie, I started working with Philip’s theater company in New York, it’s called LAByrinth Theatre Company and that was great. There are so many talented actors and writers and directors in that theater company and Phil was very kind to invite me to work with them. It’s been great working with these people. And what can you say about The Taking of Pelham 123? It’s a remake of a movie that was done in the 70s, a hostage film type situation. I play one of the hostages. It takes place underground in the train systems of New York. I can’t say too much about that because they haven’t released the script or too much information about it, but it’s going to be pretty exciting, especially with John Travolta and Denzel and Ridley Scott directing it of course. How often do you get recognized and what type of response have you gotten from fans? Every day, several times a day. People show love; they love the character, they love the show. A lot of times people say, “I love you on that show but you’ve got to die. You’re too mean.” Also, I get approached by a lot of drug dealers, I get approached by FBI agents, cops and detectives, lawyers, teachers, old, young, white, black, many different demographics. They come up to me and they tell me what they think about the show, which is great. What do you do to unwind? What kind of hobbies do you have? I like to run when I can. I like to wrestle. I wrestled in college and I still wrestle when I can. I haven’t wrestled in a few months because I just had shoulder surgery to repair an old wrestling injury from college. I like to wrestle, I like to read and I like to write. How good of a wrestler were you in college? Most outstanding wrestler my senior year. When you say you still wrestle, where do you compete? There are some open tournaments. Some of the collegiate tournaments are open. There are some pre-pre-qualifiers for the Olympics, some tournaments that qualify for pre-qualifiers and so on. And there are wrestling clubs around the country that sponsor tournaments. I sometimes go and wrestle in the New York Athletic Club, that’s the local one here. When I get an opportunity though, it’s not something you can just pick up, it’s not like a pickup basketball game, it’s all-encompassing. I love it, but it takes up a lot of time and body and sometimes I don’t have both to commit to it. Have you now gotten to a point where people are recognizing you while you are competing in these tournaments? Yeah, that’s weird. I did a tournament a few months ago and I’m wrestling and there was just all different ages, from like five to a limitless age, and there’s little kids on sides of the mat when I was wrestling in the finals and they’re yelling, “Come on, The Wire. You can do it, The Wire.” (Laughs.) It’s weird. And then my opponents wanting to take pictures afterwards. That was pretty interesting. I had never experienced that before. Probably be writing or maybe still working for the government, because I liked my job, I liked what I was doing. I worked for the Corporation for National Service, which was the headquarters of AmeriCorps and VISTA social service programs in the United States. They were doing their things and I worked in the congressional affairs department and I’m fascinated by politics and world affairs. But definitely writing, maybe I’d even be a good writer. A lot of people know that my family’s Nigerian, but more specifically, my family’s Yoruba, which is one of the larger ethnic groups there. And I speak almost none of the language, but yet I speak Spanish, which is strange. I lived in Mexico for a while. I studied abroad there and I went back a number of times and I picked it up. My Spanish is very Mexican though. Everyone keeps telling me that. Interviewed by Joel Murphy, March 2008. The season finale of The Wire airs Sunday night on HBO. The Savages is in select theaters now. For more information on Lower Ninth or to purchase tickets, visit The Flea Theater’s website. Excellent interview and promising actor.keep it up,more power to your elbow.pls i wish to have conversation with gbenga akinnagbe,can i have his email address?thanks.